Ivanka Trump will arrive in Hyderabad on November 28th, 2017 and will be present in the capital city for 2 days to attend the GES 2017. Ivanka Trump, daughter of the President of the US Donald Trump, will attend the Global Entrepreneurship Summit 2017 which will take place in Hyderabad between November 28 and 30. The Deccan city is all decked up for the summit and is gearing up for the visit of the POTUS’s daughter. The summit, GES, will have few Tollywood stars attending and will also address the panel at the summit. 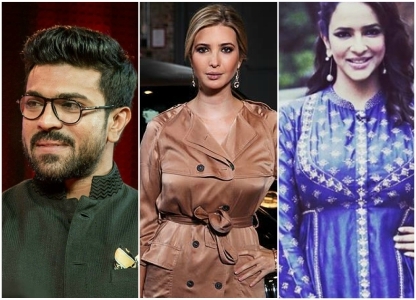 Mega Power Star Ram Charan and actress Lakshmi Manchu will speak at the Global Entrepreneurship Summit 2017 which has Ivanka Trump as the special guest. Ram Charan and Lakshmi Manchu will address the gathering on November 29th, reports indicate. The Tollywood stars will speak before Ivanka Trump and will address on topics related to entrepreneurship and business opportunities in India. Lakshmi Manchu, who has lived in the US for few years and later moved back to India, has friends in the US and stays connected with them. Ram Charan and wife Upasana often visit the US for various reasons which includes business interests of Upasana Kamineni who is in medical care. Ivanka Trump will arrive in Hyderabad on November 28th, 2017 and will be present in the capital city for 2 days before going back to the US. Ivanka will also speak at the summit which will be attended by delegates from various countries across the globe. The GES 2017 will also be attended by Prime Minister of India Narendra Modi. Exactly how are these two talentless losers qualified??? This is the reason India will never move forward-always putting talentless “actors” at the forefront of any international event.